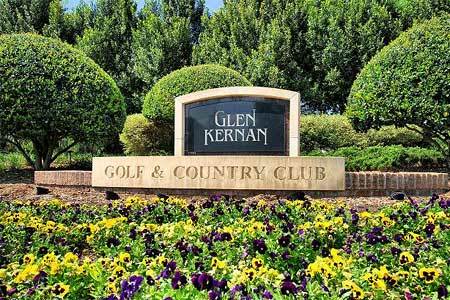 Glen Kernan Golf and Country Club in Jacksonville, Florida. With 600 acres of natural beauty and spectacular views, Glen Kernan offers its residents privacy from the outside world while still being centrally located. Featuring clubhouse with formal dining room and full service bar and grille, Robert C. Walker designed 180-acres golf course, golf pro shop, junior Olympic-size saltwater pool, fitness center featuring state-of-the-art equipment and licensed fitness traniner/massage therapist, sports complex with lighted tennis courts, basket ball courts, volleyball court, soccer field, playground, 80-acres lakes, walking paths and covered Pavilion with food prep area. Only the finest of Jacksonville's premier builders have been chosen to design and construct a unique collection of homes of distinction within Glen Kernan. Homes start at 3,200 square feet and lot sizes are half an acre minimum, giving its residents a feeling of privacy in a luxurious setting. Villini at Glen Kernan is a private upscale gated single-family community at Glen Kernan with exclusive 52 homesites featuring four to five bedroom single-family detached homes, with up to four and one-half baths, three car garages, and optional studies, retreats, and game rooms.The moment you enter Villini, you will be transported to a diferent world. It is here that you will discover a unique gated sanctuary of only fifty-two residences, all with a consistent European flair. A feeling of community is immediately apparent with an authentic theme of rustic architecture reminiscent of Tuscany, France and the Mediterranean Seacoast Residents have full access to Glen Kernan Golf & Country Club amenities. Pricing from the upper $600's. For a private tour and showing appointment, please call (904) 307-8998.